It’s been called the magical or super stone. It’s soapstone, the stone with natural distinctive properties. Soapstone countertops will not burn, melt, or because it is non-porous, this stone will not stain. It is one of the heartiest of natural stones, yet run your hand over a soapstone slab, and you’ll experience the velvety touch for which it is named. Soapstone is easy to clean with soap and water and will last for years to come. With slabs as tough and as durable as granite and marble, soapstone is also invulnerable to acids and chemicals. Acidic foods and cleaning products will not harm your soapstone. Nonetheless, soapstone does have its kryptonite. A very soft stone, soapstone will scratch, so cutting on this kitchen countertop surface is taboo. It’s still a stone you want in your inventory so you have more options to show in your slab yard. Because of the stone’s impervious qualities, its versatility in design is boundless. Use your imagination; this amazing natural wonder makes for a wonderful addition to any room in the home. As a floor tile, slip-resistant soapstone is popping up in mud rooms across the country. Enjoy both the beauty and safety of a soapstone kitchen countertop. Its non-porous quality allows the Food and Drug Administration to recognize soapstone as a food-safe surface. Discover its splendor as a backsplash. But, because it scratches easily, we only recommend you install this in low traffic areas of the kitchen. Apply soapstone to your shower walls and incorporate as tub surrounds. Soapstone is perfect as a bathroom vanity top since it is resistant to chemically-based bath products. 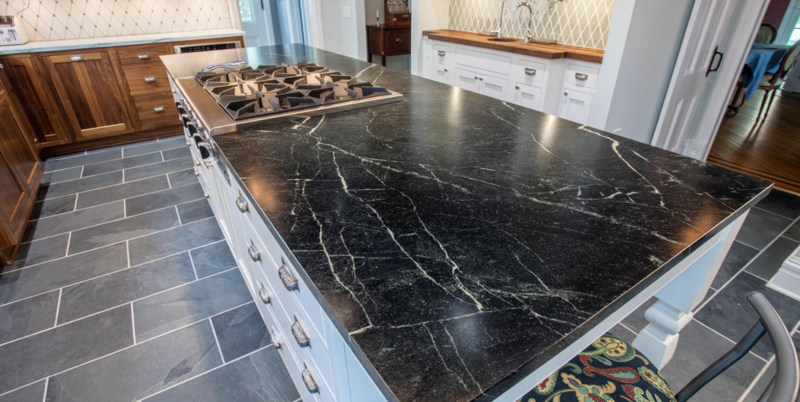 Even if cut from the same slab as your kitchen countertops, soapstone’s makeup allows you to alter the degree of darkness after installation. It’s more of that soapstone magic coming into play. Sure, you can keep the light gray with creamy, white veins found in nature, or enhance the stone, bringing out its rich darkness. There are two popular methods, both as easy as opening up a container of either mineral oil or wax. When it comes to darkening your soapstone, it’s just a matter of preference. Both create a new, natural look with amazing results. If you choose to wax, a little more elbow grease is necessary, akin to waxing your car. Whichever you choose, be sure the oil is organic and food-safe, and the wax is specifically manufactured for use on natural stone. Before applying either wax or oil, clean your slab with soap and water. If mineral oil is your choice of enhancers, your soapstone will immediately begin to turn almost black; some slabs will produce a rich, deep green. How often you repeat this process is totally up to you to reach your desired darkness and sheen. Some homeowners apply once a month for a year or two, some repeat just three times and are satisfied with the results. You can test to see if a new application of oil is warranted. Just like sealers for other natural stone, if drops of water are absorbed into the stone, it is time to reseal. With soapstone, if water droplets leave a dark spot, re-oil. Wax, on the other hand, is known for giving your soapstone an even richer, deeper color. The deep, charcoal gray created by these special waxes is breathtaking. Some homeowners claim the soapstone countertops treated with wax feel smoother to the touch. Wax can also be cleaner to work with since the non-drying mineral oils do not evaporate but dissolve over time. Wax leaves little residue. Like oils, you will need to reapply wax to reach your desired shade. If you like to buy American, you’re in luck. The popularity of soapstone resurrected a dormant quarry in Virginia a couple of years ago. Opened in 1888 and closed for almost 40 years, the Alberene Soapstone Company claims to be the only surviving supplier of American soapstone. They quarry the architectural grade of this metamorphic stone, as opposed to the unstable grade of soapstone that can only be mined for its talc content. While the quasi-industrial look of soapstone may not be for everyone, the beauty of this stone cannot be fully realized until you create your own original kitchen countertop or bathroom vanity top with oils and waxes. Soapstone countertops are wonderful, unique additions to any design, from modern rustic to contemporary. Soapstone is not the most popular natural stone but it is a good one to add to your container when looking for stones to add to your inventory. Customers still enjoy looking at a variety of stones when visiting your slab yard.